We may not be having the best summer ever here in Cornwall, but we have had a few warm and sunny days. We even had a whole week where it was actually way too hot. When it’s that hot, all I want to eat is cool foods and ices. I headed for the freezer, but when I got there, the freezer was bare – of ice cream anyway. To avoid another Mother Hubbard moment, I converted a large bag of cheap seasonal plums into these rose plum yoghurt ice lollies. I’ve been admiring the wonderful ice lollies that have been springing up all over the net this summer, so a few weeks back, I took the plunge and bought myself some ice lolly moulds. As soon as they arrived, I realised it was not going to be as easy as I’d imagined. I needed a considerable amount of clear space in my overcrowded freezer. A bit of lateral thinking was required. I managed to squeeze some ice packs into the freezer and as soon as they were solid, I whipped them out into a cool bag along with some of the contents. This created enough space for my lolly mould and the rose plum yoghurt ice lollies were good to go. Making the rose plum yoghurt ice lollies was simple. It was just a case of stoning the plums, whizzing everything up in my trusty Optimum 9200A power blender and filling the moulds. When it came to releasing them, however, I was a bit trepidacious; I had visions of limpet lollies steadfastly refusing to budge. There were no accompanying instructions, but I guessed dipping the mould into warm water might be a good idea. I’ve subsequently learnt that’s exactly what you’re meant to do. 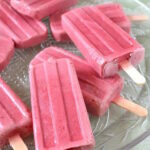 The rose plum yoghurt ice lollies were a first attempt and one I was pleased with: they were tangy tart and refreshing. My rose syrup gave just a hint of delightful floral sweetness which complemented the plums beautifully. All we need now is some more hot weather. 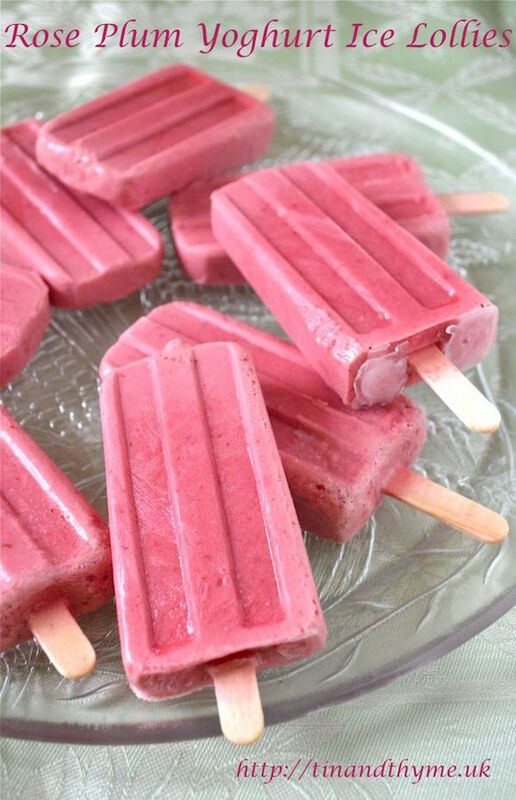 Tasty tangy and tart these ice lollies are fruity and refreshing with a hint of rose. Just what you need on a hot summer's day. 4-8 tbsp rose syrup - depending on how sweet the plums are and how tart you like your lollies. Wash and stone the plums. Whiz in a high speed blender with 4 tbsp of rose syrup - I used my Optimum 9200A for 20 seconds. Add the yoghurt and whizz together until just mixed. Taste for sweetness and add more rose syrup as necessary. Pour into 10 ice lolly moulds + 2 philadephia tubs. Push a wooden stick into each mould. Freeze for a minimum of 2 hours or until completely solid. Dip the moulds into hot water for 15-30 seconds, then pull the lollies out by their sticks. If they are difficult to remove, dip in hot water for a few more seconds. This quantity makes more than the quantity needed for 10 ice lollies, but can be poured into little plastic tubs and served as ice-cream. If you don't have rose syrup, use 2-4 tbsp sugar instead with a little rose water or a drop or two of rose oil. Any plums can be used here but the more purple they are, the better colour you will have. I’m sending these rose plum yoghurt ice lollies to Kavey Eats for Bloggers Scream For Ice Cream (BSFIC), where the theme this month is fruit. NB 7/8/16 – I’ve been asked by several people now where I bought the ice lolly moulds from. So in case you are interested too, they came from Amazon and here’s the link. 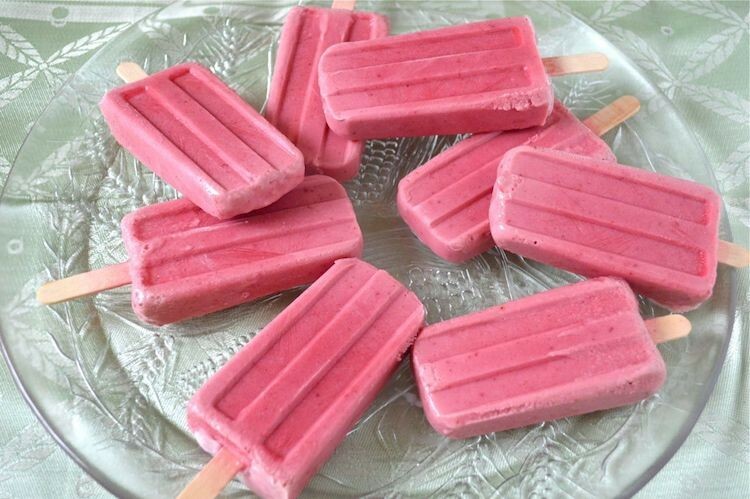 Rose Plum Yoghurt Ice Lollies. PIN IT. Wow – this sounds fab! I was drawn in by the mention of rose – but this is actually a great idea for the plum surplus that ends up in the freezer. Oh for a surplus of plum – any plums. I used to get a few from my mother’s tree, but she’s not had much in the last few years. Hope you like the recipe. They look fantastic! I love the combo of flavour here, Choclette. Such gorgeous lollies, love the colour and your flavour combination sounds perfect! Amazing first lollies! Thanks Kavey. I was pretty impressed with them, though it’s mostly down to the lolly moulds really. I love the flavour of rose but must admit I have never paired it with plums! what an intriguing combination. I might have to put that on a cheesecake. This is my favourite summer dessert of choice. I’m not a huge lolly fan to be honest but than you for inspiring such a lovely combination for floral and fruit! Oh yes, rose plums on a cheesecake would be fantastic. I’ve found rose goes particularly well with plums, rhubarb, apples and most berries. Wow your iced lollies look very professional in the photo – look like you do it regularly – and I love the sound of ingredients – would be great in an Aussie heatwave! They would be perfect in an Aussie heatwave Johanna and thank you for being so generous. It was really tricky to take the photographs as it was so hot – everything was melting fast. So delicious. I adore the plum and rose combo and you’re so right, a lolly is lovely on a hot day. I’m actually in the garden laying on the lawn now!! Thanks Emma. You can probably tell I’m a big fan too. If it’s summer and I’m using fruit, I always think ‘rose’! Lovely! Fab combination of ingredients and such a beautiful colour! I always find it very tricky to get lollies out of the mould….. especially when you are only trying to get one! Thanks Kate. I think the answer to only getting one lolly is taking them all out, then freezing them again in a bag. That’s what I did anyway and it worked fine. I adore the colour of these they look delectable. I have never thought to combine plums and rose, interesting combination. I’m a big fan of rose and summer fruits Nayna. I’ve not had a fail yet. what a super recipe! Simple but very creative. I haven’t see plum pops before but I love the idea so much! Thanks Kellie. Having gone through a phase of making recipes more complicated than they need to be, I’m enjoying keeping things simple at the moment. Ah well, you did better than me. My moulds weren’t cheap, but they are good. Making lollies is a bit of an art and I think I need to practice a bit more.